A dense smoke column was originated last weekend at the City of Justice in Valencia. 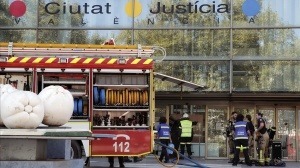 The origin was a fire, possibly electric (one of the leading causes of fires), that forced to evacuate preventively the main judicial building of Valencia. Flames and smoke have destroyed or affected the electronic installations, systems and appliances, and some judicial documentation. Four courts have suffered serious damage and the TSJCV has decided to suspend the activity today at all headquarters, except for the guard. The Ministry of Justice could not clarify yesterday if the fire detection system of the building was activated. Some authorities considered the possibility of a certain delay in its operation. “The smell of burnt plastic was terrible,” one official said. That is why the firefighters ordered to ventilate to the maximum the facilities. The TSJCV declared that the City of Justice will be closed to the public, the indicated trials will be suspended and there will be only activity in the courtrooms. This time we were “lucky” since there weren’t anyone dead but many important documents were lost. As you see, it is not necessary that there are human losses to be an important fire. No buildings are exempt from the threat of fire, no matter houses, public buildings, government buildings …. Unfortunately we regret when the tragedy have already happened.